Ivana Baquero in PAN’S LABYRINTH. Photo by TERESA ISASI. “Pan’s Labyrinth” is Mexican filmmaker Guillermo del Toro’s sixth feature film, and judging from the critical praise and accolades that are heading its way, it is being recognized as a masterwork. It was heralded at the Cannes Film Festival, appears consistently on the nation’s film critics’ top ten lists of 2006, and will probably be the leading entry in the foreign language category in the 2007 Academy Awards. All this is not surprising. Del Toro has already demonstrated a great gift for bringing visual clarity to our deepest fears. From “Cronos,” his imaginative spin on the vampire mythos, to the monster movie “Mimic,” to “Hellboy,” his film adaptation of the fantasy comic book superhero, del Toro has shown a remarkable genius at creating darkly imaginative fantasy worlds inhabited with monsters and otherworldly creatures, and imbue them with perverse variations of human characteristics that both fascinate and disturb our collective consciousness. These powers are in full display in del Toro’s latest marvel, “Pan’s Labyrinth,” but he has placed them in the service of a higher purpose. What raises “Pan’s Labyrinth” above del Toro’s earlier films is the emotional depth of the very real, heart-wrenching story at its core. The fantasy world del Toro has concocted is only tangential to the real drama, though it adds dramatic intensity and moral resonance through its use of symbolism and fable. In the exaggerated manner of the most horrific fairy tales, Ofelia’s stepfather (played with exquisite control by Sergi Lopez) is a monster of epic proportions. Vidal’s brutality is so automatic, so unhesitant, that one cannot help but think that he is not really human. Unfortunately, he is all too human, too real, and there are scenes where his cruelty is so ghastly that the monsters of horror movies seem harmless in comparison. This is why children should stay away from “Pan’s Labyrinth.” It’s one thing to see a monster chew off a person’s head, but to witness an upstanding figure of society, a leader of men, bludgeoning an innocent peasant’s face to pulp is the kind of reality that does not need to be part of a child’s awareness. From the start, Ofelia finds a means of escape from the terrible reality of her new home by following the fairies of her imagination into another world. In this world, at least, she has the power to control her fate. It is here where a monster who is half human and half faun (the satyr Pan of the title) reveals to her that she is the long lost princess of the Underworld, and that she will be able to return to the father she abandoned long ago if she fulfills three tasks before the next full moon. Del Toro weaves the fairy tale of Ofelia’s imagination into the real world with such visual and narrative grace that the line between fantasy and reality gradually becomes less and less distinct. In fact, the real drama is so dark and sinister, both dramatically and visually, that the fairy tale sequences seem like other rooms of the same house rather than an alternate universe. Alongside the villain Vidal, the creature Pan appears humane and compassionate. As we travel with Ofelia between reality and fantasy, we become aware that crawling through a tunnel of fat cockroaches to retrieve a golden key from a giant toad’s belly seems like a Sunday outing compared to being reproached for some misconduct by her stone-faced stepfather. It doesn’t help that del Toro feels the need to remind us of the more gruesome aspects of the human body, that frail house of our souls, in the unfolding drama. Ofelia’s mother is constantly showing abject pain from her pregnancy, the baby inside her like a cancer that’s tearing her insides out, and the birth scene is a bloodbath. The torture scene is gratefully left to the imagination, though a glimpse at its effects is almost as draining. Del Toro shows less restraint elsewhere, as the slashing of a mouth, or the amputation of a gangrenous leg. I don’t begrudge del Toro his need to show the mutability of this mortal flesh, since it seems part of a larger truth about all the horrors of human nature. I daresay that it is this fixation on the dark side of existence that drives his art. One could even assert that for del Toro, who was born into a Catholic culture, physical suffering and evil are never very far from each other. In the Catholic mythos, Christ endured physical torture to save mankind; Catholic ideology encourages the belief that physical suffering brings us closer to God. And then there is the belief that evil is the work of the devil—the ultimate monster of Christian symbolism. But as del Toro alludes so eloquently in “Pan’s Labyrinth,” monsters are not extrinsic to ourselves, but extensions of who we are. In Ofelia’s imaginary world, the demon Pale Man, who eats children for dinner, has his eyes located in the palms of his hands, and must cover his face with his hands in order to see. The imagery is potent with thematic intent. Vidal’s own senses are all too keen, but he blindly submits them to the fascist ideology he serves. It is his fascist beliefs that allow him to find comfort in his own cruelty. Del Toro’s scathing accusation, that the cloak of ideology allows evil to thrive unchecked, finds a perfect illustration in fascist Spain. And indirectly, del Toro points an accusatory finger at the Catholic Church as well. The two ideologies joined hands during the civil war, and the alliance with Franco was instrumental in his victory. This allegiance does not go unmentioned in the film. In one scene, the village priest dines with Vidal, and the two seem like counterparts of the same system. The devil did not bring evil to mankind. Man did that on his own, and then imagined a devil to give a face to the evil that is so unfathomable otherwise. That is the birth of fairy tales, and it is also the birth of ideology. Just as fairy tales are a child’s way of coping, adults embrace ideology as their own way of coping. For del Toro, the means of escape is just as imaginary, though the monsters are unfortunately very real. 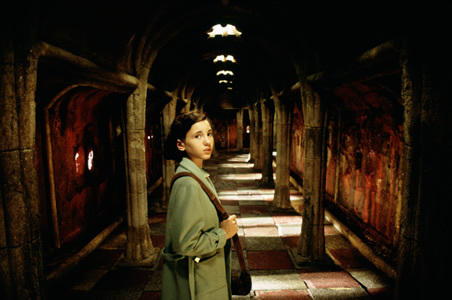 By the movie’s end, the fantasy world of Ofelia’s imagination moves almost imperceptibly to center stage, and the two worlds seem to merge in an ingenious wave of the cinematic wand in del Toro’s hand. It is an exquisite ending, both heartbreakingly sad and yet cushioned with a sense of peace—and hope. Borrowing from Christian parable, del Toro ends the film with a sacrifice, and the birth of a newborn boy child. But in an inversion of the Christian story of Jesus, the rebels who have saved the child vow that the boy will never know who his father is. It is a break with tradition, with the old ideology, and a glimmer of hope. Del Toro is part of a triumvirate of Mexican filmmakers that includes his friends Alfonso Cuaron, the director of “Y Tu Mama Tambien“ and this year’s “Children of Men,” and a producer of “Pan’s Labyrinth;” and Alejandro Gonzales Inarritu, the director of “Amores Perros” and “Babel.” The year 2006 has proven to be a banner year for all three, but if one had to choose the artist at the height of his powers, this is del Toro’s year. “Pan’s Labyrinth” is impeccable filmmaking; it alone might be enough to seal del Toro’s reputation as a master of cinema.